Many thanks to the wonderful Great Escapes Virtual Book Tours and to all of the kind hosts. The Spirit in Question (Lila Maclean Academic Mystery #3) is now available wherever books are sold! 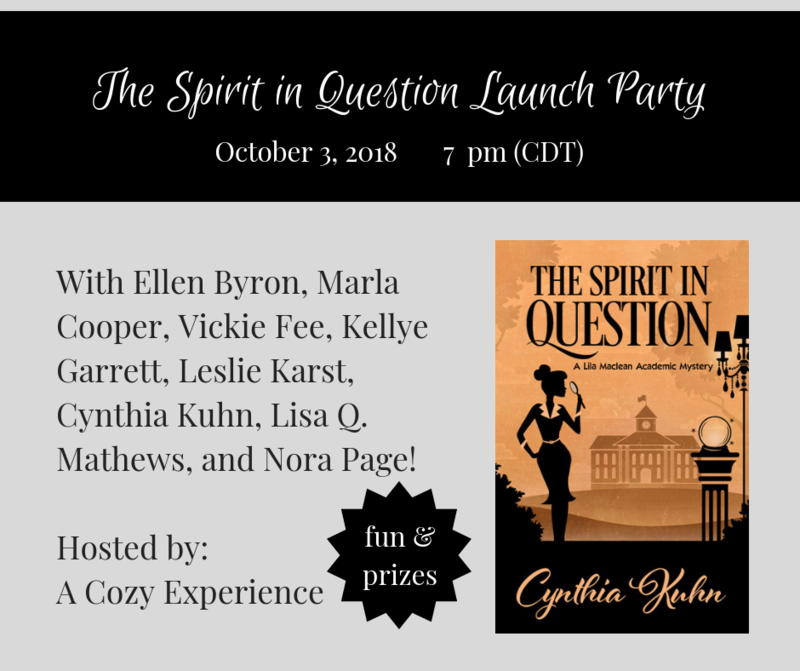 And here’s your VIP invite to the Facebook launch party: Wednesday October 3, 2018 at 7 pm CDT. Visit the event page, click “going,” and invite your friends! The more, the merrier. Once the party begins, all you have to do is click on the discussions tab to participate. English professor Lila Maclean knew drama would be involved when she agreed to consult on Stonedale University’s production of Puzzled: The Musical. But she didn’t expect to find herself cast into such chaos: the incomprehensible play is a disaster, the crumbling theater appears to be haunted, and, before long, murder takes center stage. The show must go on—yet as they speed toward opening night, it becomes clear that other members of the company may be targeted as well. Lila searches for answers while contending with a tenacious historical society, an eccentric playwright, an unsettling psychic, an enigmatic apparition, and a paranormal search squad. With all of this in play, will she be able to identify who killed her colleague…or will it soon be curtains for Lila too?